Our autoclave sterilizers serve to sterilize medical instruments effectively as they are designed to meet all international norms including globally recognized temperature of 121 degrees and a standard range of pressure in generating steam to sterilize equipments. We design highly sophisticated autoclaves that help to destroy all kinds of bacteria, viruses and other pathogens from instruments in medical laboratories, pharmacy labs, research institutes, botanical and zoological gardens. Autoclave Aluminum (Sterilizer) Vertical Wing Nut Type Seamless. Sterilizing Time : 25-30 Minutes or As Desired. Heating Element : 2000 Watts, 220/240 Volts A/C. Autoclave S.S. (Sterilizer) Vertical Wing Nut Type Seamless. Autoclave Aluminum (Sterilizer) Vertical Pressure Type Seamless. Outer body made of thick mild steel finished with powder coating paint or S.S. The inner chamber is made of thick stainless steel. 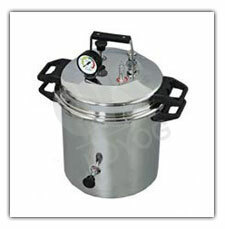 The lid is made of stainless steel & aluminum combind or full Stainless Steel. The instrument is absolutely pressure leak proof. The lid is tightened by Wing Nuts provided with pressure gauge, pressure release valve, safety valve, water level indicator. 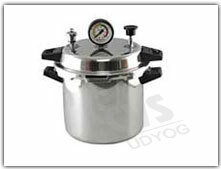 The autoclave can hold the pressure in between 5 to 20 PSI. Outer body made of thick mild steel finished with powder coating paint or S.S. The inner chamber is made of thick stainless steel. The lid is made of stainless steel plate. The instrument is absolutely pressure leak proof. The lid is tightened by radial arms through a steering wheel, provided with pressure gauge, pressure release valve, safety valve, water level indicator. Iinstrument is provided with a pedal lifting device. 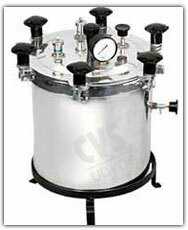 The autoclave can hold the pressure in between 5 to 20 PSI. 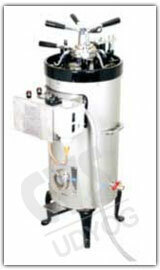 Provided with S.S basket, pressure switch & automatic water level indicator.